As the prime contractor on the Basic Combat Training (BCT) Battalion Headquarters at Fort Leonard Wood, Missouri, the LMG Design-Build team earned a CCASS rating of “Outstanding.” The project’s success is due to a strong partnership with the numerous parties with whom LMG worked, including the Fort Leonard Wood USACE Project Team, the Kansas City USACE District Office, on-site management, project management, field supervision, design teams, subcontractors, suppliers, and hard-working crews. 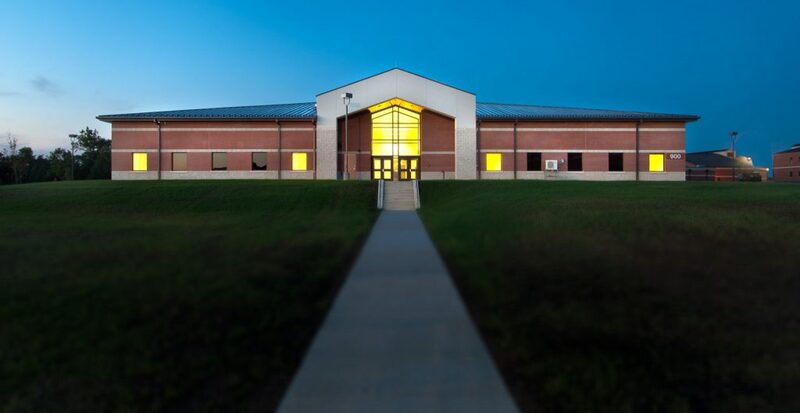 SCOPE: The U.S. Army Corps of Engineers – Kansas City District awarded LMG Construction a Design-Build contract for the design and construction of the BCT Battalion Headquarters in Fort Leonard Wood, Missouri. As the prime contractor, LMG led the design, engineering, and construction of this single-story, 23,500 SF building. Basic Combat Training Complexes are military units designed to help physically and mentally prepare individuals to become soldiers. During a 10-week course, the soldiers undergo demanding training in core Army values and how to work as part of a team. Ft. Leonard Wood is one of only five Army installations across the country where basic combat training takes place. The design and construction of this single-story, 23,500 SF building accommodates administrative and command operations. The building consists of brick veneer over metal studs supported by structural steel. Entries are full-height glass curtain walls. Lobbies have high ceilings with similarly pitched surfaces to the entry, creating grand volumes and conveying the importance of building function. The building contains two large dividable multi-purpose classrooms for training purposes. Office areas consist of command suite including battalion commander office; operations center; administration; supply and logistics; unit ministry; chaplain and asst. chaplain offices; message center; classrooms; storage rooms; vending and recycling areas; and mechanical, electrical and telecommunications rooms. Within the approximate two-acre site, the project also includes exterior improvements such as finish grading; parking lots; walkways; curbs and gutters; and landscaping. The project was designed to achieve a LEED Silver rating per the LEED NC-v3 rating system of USGBC. The HVAC system for the Battalion Headquarters implements new technology and equipment that were used for the first time in Ft. Leonard Wood history. Known as Variable Refrigerant Flow Zoning (VRFZ), the system consists of outdoor heat pumps, a branch circuit controller and indoor units. All units are capable of operating in any mode (cooling to heating, heating to cooling), with no interruption to system operation. All units are independently controlled, individually or as a group, based on a zoning method that provides maximum individual comfort while minimizing energy use.